JP Dutta, the writer and director of this new incarnation of Umrao Jaan, has said that it is not a remake of the 1981 Rekha classic by Muzzafar Ali, but rather a readaptation of the 1906 novel upon which the earlier film was based. I am inclined to believe him, because the story Dutta tells, while it features characters with the same names, is about a very different woman from the Umrao of the 1981 film. 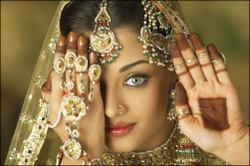 While Rekha's Umrao was defined by her repeated attempts to free herself from the courtesan's life, this adaptation's Umrao Jaan (Aishwarya Rai) is defined by her love for one man, Nawab Sultan (Abhishek Bachchan), a love that persists throughout Umrao's life, even after he proves fairly unworthy of it. Sold at a young age into a brothel dominated by the stern, imposing, yet motherly presence of its madam, Khanum (Shabana Azmi - more on that later), Umrao studies dance and poetry with the other young courtesans-in-training. She falls in love with her first patron, the rich and handsome Sultan, and has some brief happiness, but spends the rest of the film waiting for him, searching for him, or pining for him in one form or another. It's a heartbreakingly sad story; life as a courtesan may have been glamorous but it was also deeply degrading. And the film tugs at the heartstrings in all the right ways; there were times when I felt the tears welling up, and other times when I watched in horror the various debasements that Umrao endured. Though the film was criticized for slowness, I think the languid pace suited the mood of the film, which wasn't particularly long by Bollywood standards. The music was fine as well; the melodies are lovely, though the modern orchestrations are a bit overbearing and out-of-place in this period piece. Aishwarya's dancing, which in some of her other films has been more technically impressive than emotive, here is both skilled and graceful. The weak link among the performances was Abhishek Bachchan, whose listless, lifeless Sultan was a disappointment. Abhishek is cute and engaging in sweet, goofy roles like Bunty aur Babli; here, though, without the goofy charm, he appears to have nothing left to give to a serious role. Ultimately, though, comparisons to Muzzafar Ali's film are impossible to avoid, and JP Dutta's Umrao Jaan - both the film and the woman - don't measure up. The new Umrao - the character - is weak and directionless; she starts her life as a tawaif with no confidence in herself or her abilities, and she never snaps out of it. Muzzafar Ali's Umrao, in stark contrast, comes to believe in herself, determined to change the circumstances that landed her where she is, and despite her best efforts unable to do so. When Sultan betrays her she quickly learns the difference between love and the thing that patrons buy from courtesans, unlike Dutta's Umrao. These things make Muzzafar's Umrao much more compelling to watch, and her story far more tragic. It might be said that the 2006 Umrao Jaan is the 1981 Umrao Jaan with all traces of feminism excised. It is largely a story about a woman who's unhappy because she can't have her man, where Muzzafar's film was a story about a woman who was unhappy because she couldn't have herself. A note on Shabana's performance as Khanum: In the 1981 film, Khanum was played by Shabana's mother, Shaukat Kaifi. Shabana has said that this is the first time a mother and daughter have played the same role on the screen; I have no idea whether she is correct. At any rate, Shabana steps into the skin of Khanum with houkah-smoking, paan-chewing relish, and she was (bearing my own biases in mind) one of the best things about the film. It's not surprising that nearly every review I've read said that she ran away with the show. She looked fabulous, and provided an interesting glimpse into the psyche of the greedy, manipulative Khanum. Khanum must have been a courtesan herself; she nevertheless sells not just her adopted daughters like Umrao, but even her own daughter Bismillah. And she hints at some traumatic experiences in her own past, in counseling Umrao that the outside world is a dangerous place with evil lurking around every corner; what traumatized Khanum so, that she refuses to leave the shelter of her brothel even when Lucknow is under siege and everyone else is fleeing? Indeed, Khanum was so compelling that she left me longing for a film about her own life.